After 22 months of work, a $140 million renovation and expansion of the Greater Columbus Convention Center (GCCC) is now complete. The project is highlighted by 373,000 sq. ft. of contiguous exhibit space and major additions include 10,000 sq. ft. of two-level meeting space, upper-level show offices and nine meeting rooms with outside windows, for a total of 75 meeting rooms. Additional first-class upgrades offer an overall improvement of the guest experience with hotel-grade finishes, enhanced lighting and better way-finding signage. 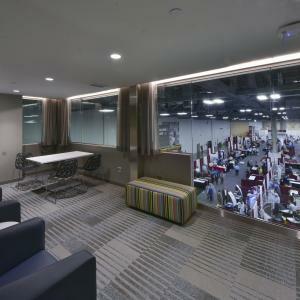 One of the most important pieces of the project that is the purposeful sense-of-place created in the modernized center. The expansion created a large, two-level open atrium entrance featuring beautiful natural light and elegant tile on the north end of the center. Of course, in a practical sense, this area serves as an ideal pre-function space for the Short North Ballrooms. More than that though, this prominent entrance will better connect the center, and its guests, with the vibrant Short North Arts District just beyond its doors. For those that may not have time to check out the cool galleries of the Short North, that’s OK! 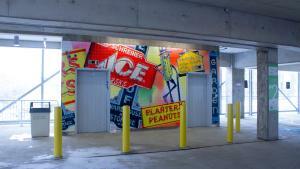 A collection of more than 150 pieces of local art was curated for the facility and its parking garages, turning the renovated center into a gallery in its own right. No other sense provides a lasting bond with a place quite like taste, and new options within the renovated GCCC certainly allow for delegates to have their fill. Both the Discovery Café and South Café & Marketplace now offer locally made food and beverages. The Discovery Café will soon provide the ultimate farm-to-table experience for those attending meetings in the center, as food-service provider Levy is installing the country’s first indoor convention center hydroponic vertical farm. This “smart farm” is expected to yield about 5,000 pounds of produce per year, with unused items being donated to local charities. Additionally, Levy has a partnership with Cameron Mitchell Premier Events, one of Columbus’ most respected restaurateurs, which will allow for distinctive restaurant-quality food and service, an innovative approach and access to signature chefs and a local network of suppliers, from which 85 percent of all products used by Levy are sourced.